When we last met I was talking about Zoe/Juniper’s work-in-process “always now.” I just returned from a trip to Jacob’s Pillow Dance Festival, in western Massachusetts, where the company had a two-week residency funded by the Princess Grace Foundation. “always now” is a two-part creation, performed simultaneously in different sections of a theater. About two dozen audience members are split into two groups; one half views Part A, the second Part B, switching sections midway through the live event. Visual designer Juniper Shuey and choreographer Zoe Scofield have dreamed up two very different environments. Part B involves audience members fully: we lie on faux sheepskin mats, face up, gazing at six dozen inflated dark balloons suspended in bunches from the ceiling. Some of these balloons are stippled with copper leaf. Five excellent dancers move among, above and through the supine audience members. You can read more here. Part A provides a completely different experience for the audience. As we enter the space, a solo performance is already underway. Dancer Navarra Novy-Williams, in royal blue leggings and a dark shirt, moves slowly--very slowly-- across a butcher-papered floor, into an illuminated square space. This square is delineated by curtains of fringe moored to thin wooden beams that hang from the ceiling. We can see Novy-Williams through the fringe, but also through staggered gaps in the curtains. Large silver bowls are placed at intervals on the floor. Novy-Williams approaches them from time to time, lowering her face to one large bowl to sip water, dipping her hands in another that’s filled with silver paint. She wipes it across the nape of her neck, like a collar. Scofield wants the audience to move about the square. We’re invited to sit on the butcher paper, but sit at your own peril. Novy-Williams may come near to grab up a strip of paper between her teeth, like a dog grabs a bone. She crawls along, ripping the paper into a curving strip as she moves. Over more than an hour, Novy-Williams eventually removes the entire paper carpet, revealing another square beneath it, shiny silver, like the paint on her body. A soundscape envelops this solo, rhythmic pulses interrupted by occasional children’s laughter, the reverberation of a gong, or simply silence. Scofield conceived of Part A as a durational performance, a counterpoint to the far more active Part B. Although we’re free to move about during Part A, we have to adjust our pacing to Novy-Williams, rather than the other way around. She may glance our way, but she doesn’t make eye contact per se. Instead, she’s enacting a very private ritual. Unlike Part B, where we are entwined in the performance, with Part A we are strictly spectators. I’m still mulling over the relationship of the two sections of “always now.” They don’t share a movement vocabulary, and while the audience may move about in Part A, our perspective is still fairly traditional: audience watching performers. Part A is beautiful, but distant, and I left the Doris Duke Theater puzzling over what I'd seen. Zoe Scofield takes a turn in "always now" Part A. Wish I could have seen her perform this. Lucky for me, Jacob’s Pillow has a wonderful archives, overseen by a man named Norton Owen, Director of Preservation there. It’s thanks to him that I got to be in residence for three days, and thanks to him that I could watch Novy-Williams, then rush over to the archives. Owen found a book for me about the origins of dance as ritual. I settled into an armchair. 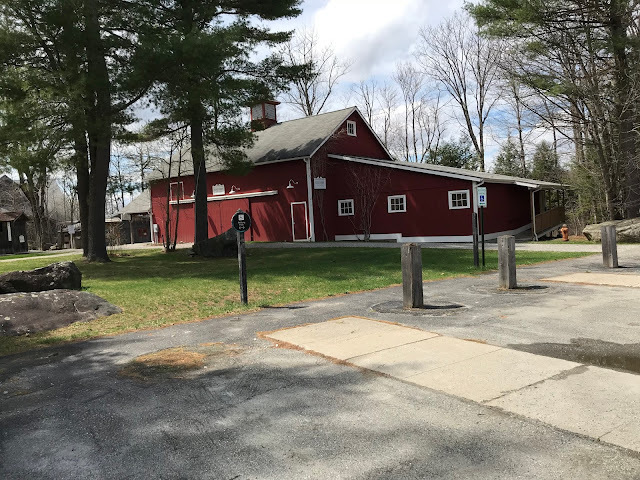 This red barn houses the Jacob's Pillow archives. It's awesome! That struck me as exactly what Scofield has created in “always now,” particularly with Part A. I write and talk for a living, so I'm driven to translate, to explain, to discover inherent meaning in an artwork. Sometimes I see narrative where others don’t; sometimes a dance will have a more literal and evident story. With “always now,” Scofield builds on her recent works like “A Crack in Everything,” and more recently “Clear and Sweet,” where she and Shuey use movement, imagery and video (along with music) to explore ideas. 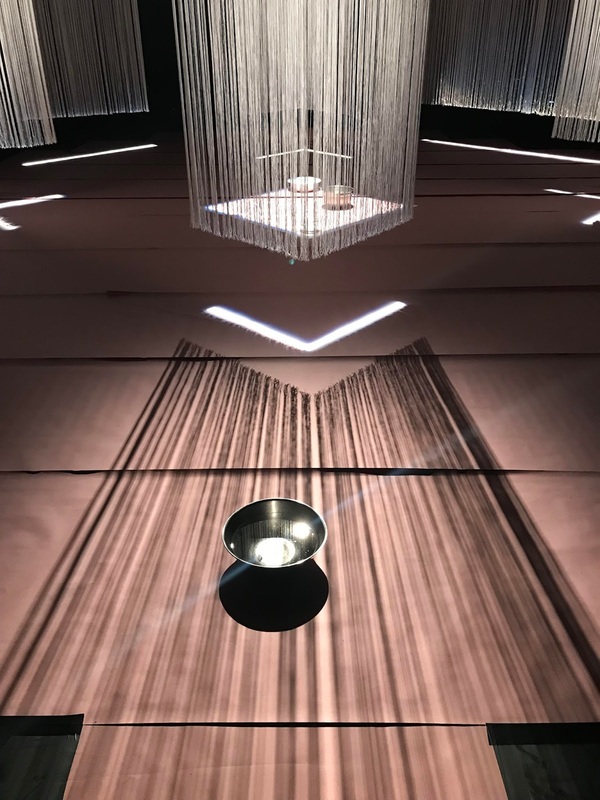 Unlike those works, “always now” is less issue driven and much more about creation of a sensate experience, both for the dancers and those of us who witness it as audience members. Part B, for me, was elemental, as in earth, air, water (but not fire—yet). It’s primal in the way early humans used dance, or song, or story, to place themselves in their world. I took my place in Scofield’s world, and now I find it very hard to leave. Each of us sees the world from a unique vantage point. And when our perspectives change, so do our perceptions of what we see around us. I'm sure there are reams of psychological treatises on this topic, but at this moment I'm contemplating the subject through the lens of my experience last weekend at Jacob's Pillow Dance Festival. I traveled to western Massachusetts to follow Seattle thinker and choreographer Zoe Scofield. She got a grant from the Princess Grace Foundation for a two week technical residency at the Pillow, to work with another choreographer, Bebe Miller, on a project called "always now." As soon as I arrived I was escorted into the Doris Duke theater, a literal barn of a space. 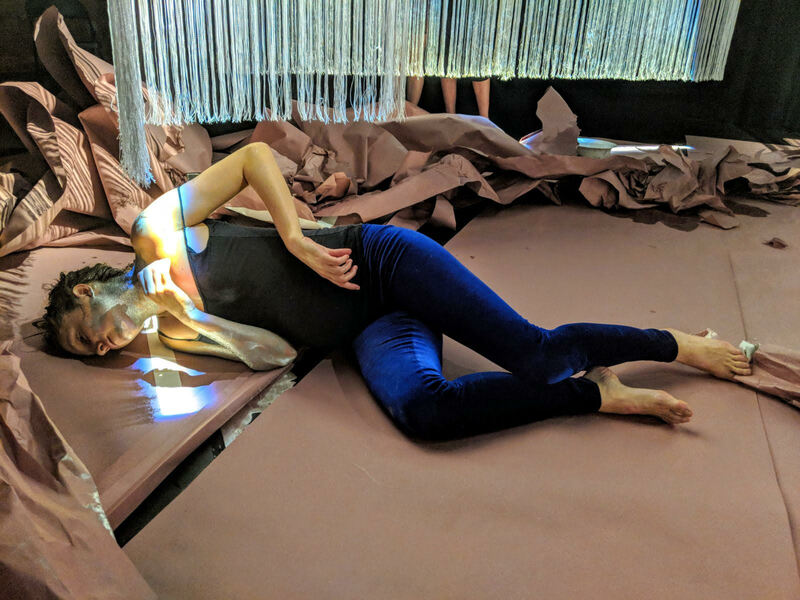 Zoe and her artistic partner Juniper Shuey transformed what had been a more traditional performance venue into two distinct sections, divided by a heavy black curtain. Once space--think of it as section A--was a shrine of sorts. Eight "curtains' of white fringe hung from the ceiling, not quite touching the floor. Along with the lighting design by Thomas Dunn, this fringe formed boxes around several silver bowls, and a single dancer, Navarra Novy-Williams. I'll write a separate post about the durational ritual solo she performs over the course of more than 60 minutes. For now, I'm going to focus on section B. Scofield had in her mind to play with the nature of perspective; how do we look at each other in news ways? How do we interact with one another when we're not standing toe to toe, or in a traditional audience/performer scenario? According to program notes, she wanted to explore how her dancers could integrate with the audience. For me, it was about how I, an audience member, was enfolded into the performance in ways I had never experienced. "always now" is performed for a very small audience. Approximately a dozen people at a time can be in either room. In Part A, we enter to a solo in progress. We are in command of our shifting perspectives, walking around the dancer, choosing where and how to watch her. In Part B, we enter the space and sit in chairs along the side, waiting for individual dancers to greet us and usher us to fleecy mats on the floor, where we lie supine for the duration of the performance, approximately 30 minutes. Once we're lying on our backs, we gaze up at six dozen large inflated balloons suspended in bunches overhead. These balloons are dark, and many are stippled with flecks of copper flakes. They are a bit sinister, but also pillow-y; once the lights come up on them I feel I have entered another world. Five excellent dancers--Shane Donohue, Kim Lusk, Troy Ogilvie, Kevin Quinaou and Gilbert Small--perform in this room, but unless you eyes like a flounder, on the side of your head, there's no way to see everything they're doing. However, you do experience it through your other senses: you hear their feet as they shuffle or stomp around the supine bodies, and you feel the vibrations travel up your spine. You feel the whisper of air on your face as Ogilvie leaps over you. You shiver with a bit of apprehension as Small and Quinaou tangle above your head. When Small hoists Quinaou over his shoulder, Quinaou's hand dangles just a few inches from your nose. You smell his skin, the sweat that sheens it. Every audience member has a different experience, depending on where we lie. But our perspective isn't only about our physical positions on the floor. It's also about our deeply held beliefs and the ideas we bring into the space with us, whether we're watching "always now" or a nightly newscast. I have spent a couple of years thinking deeply about why art really matters in contemporary society. That comes out of my need to justify arts coverage to news editors. But it's more than job security; I believe artists serve a vital purpose in our crazy world: they offer us insight into ourselves and our shared humanity; they give us new visions that can open us up to change of all types. I have no idea if Scofield had these lofty goals in mind when she first conceived this performance. All I know is how it affected me. To use the word 'profound' would be an understatement. I was lucky enough to experience "always now" several times over my stay at Jacob's Pillow. With each immersion into the piece, my mind traveled in different directions. First, I was conscious of the immediate sensations. Lying on a stage, in the middle of a dance, is nothing like watching a piece from a sitting or standing position several yards removed. I felt everything deeply. I left the Doris Duke theater shaking, with no words to describe what had overcome me. After subsequent experiences, I began to think about something a fellow arts writer once told me. He approaches every performance with an open mind and an open heart, ready and willing to go where it takes him. Maybe even to shift ingrained opinions and perspectives. It's something I keep in mind, but don't always practice. I am an aspiring wordsmith; I have a need to use words to document and describe the world around me in the same way a choreographer like Zoe Scofield uses gestures, environments and her dancers to articulate what bubbles in her fertile mind. Zoe/Juniper's residence at Jacob's Pillow was part of a new series there that cultivates work-in-process. I have no idea if, or when, the wider world will get a chance to experience "always now." I can only hope "always now" really will be here always.